There’s no doubt that Lil Wayne is a hip-hop legend in his own right, and with his latest movements rolling out the promotion of Tha Carter V, he’s flexing the muscle of exactly how relevant he still is. Through the use of social media outlets, celebrities like Kobe Bryant and Floyd Mayweather took to Instagram to show their respect to the self-proclaimed “best rapper alive”. Earlier this week, 5-time NBA champion Kobe Bryant posted a picture on twitter of (what seemed to be) the album cover of Weezy’s upcoming album “Tha Carter V”. Although, it was later stated that it was not the official album cover and instead to spread the message that “Tha Carter V” season is here. Yesterday, undefeated boxing superstar Floyd Mayweather posted a video on Instagram of Weezy and Drake in the studio rocking only to the beat of the much anticipated single “Believe Me”, and the cover art is presented in the slideshow of this post. Utilizing A-list celebrities to promote an album or a single is a genius and brilliant way of promoting, where Weezy is one on a very short list of artists who can pull the greatest athletes to help with his promotion cycle. 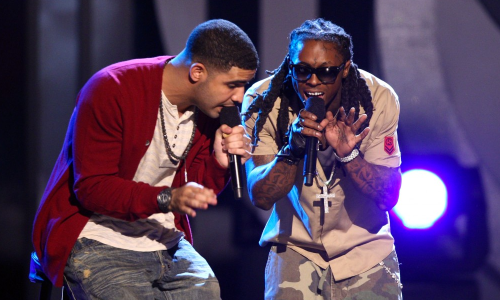 We’re definitely looking forward to the track with Drake because the combination of those two on a track is lethal.